Oh hello there Mr. CHP Officer dude, Sir. I ventured out today for some Christmas shopping. Yes, all those people who converged on malls and stores this weekend who I was making fun of Friday night? That was me today. Amazon has served me pretty well but there are still some outstanding items on my list. I checked it twice. So out I went today because really, if you are going to leave the house to go shopping amid crowds of people, you need to make sure you pick a cold, wet, miserable day to do it. I”m driving Sweetie’s car. Though I suppose I should identify it as “our” car since we are married. But this car has been in Sweetie’s life waaaaaaay longer than I have and he usually leaves it as his mom’s house in California. Last time we were here he paid for the registration and I took it in for a smog check. I called my mom-in-law a couple of weeks ago to see if the registration sticker came to her house. Nope. She had not seen it. I bugged Sweetie to check on it. He bugged me to check on it. I bugged him some more (yes, we go through this routine quite a lot). He checked on it and got an e-mail confirmation the registration material is on the way. Mom-in-law promptly mailed it to me. I was driving the car around last week worrying about my lack of sticker. I wondered it CHP (California Highway Patrol) officers would pull someone over merely for a lack of current sticker. Surely they have more important reasons to pull people over and if you happen to have out-of-date registration – well, then you may get an additional ticket for that. Yes, on my oh-so-jolly adventure through the bleak haze, I saw today behind me – flashing blue and red lights amidst the grey. And………..heyyyyyyyy……*mindflash! *……….I have my reg sticker! I threw the contents of the envelope from my MIL straight into the glove compartment so that I wouldn’t forget about it. Then I forgot about it. I pulled onto the shoulder and dove across the front seats to open the glove compartment (Why do we still call them glove compartments? Does anyone store gloves there? Do people call it something different these days?). I pulled out the paperwork, rolled down my window and put on my most sheepish smile. “uhhhhh….because I was going 10 miles over the speed limit?” No! Don’t say that out loud. Look sheepish and keep your mouth shut. I was going to say something about the fact that my husband would be so upset with me, but really? – Sweetie doesn’t get upset about that sort of thing. And hell if I’m going to come across as a browbeaten wife even if it does get me out of a ticket. I just smiled and waved my sticker at him. Thank goodness I remembered to throw the latest insurance card in Sweetie’s car also. He grabbed my license and the car insurance paperwork and wrote something down on a pad of paper. He walked around to the front of the car. And then, what does the CHP officer do? On this dreary cold day with the gray skies and spitting clouds and frigid air? He walks around to the back of the car and PUTS THE STICKER ON FOR ME. He walks back to the passenger side window and hands me a clump of sticky foil and tells me he scraped the old ones off because the new sticker probably wouldn’t stick, there were so many old ones still on. Then, he tells me to wait until it is safe and pull back out into traffic. End of story. Have a nice day. No mention of my speed. No lecture about letting my reg sticker sit in my glove compartment. He does me a favor and sends me off on my way. I couldn’t stop grinning at him as I flustered my way through a “Thank you!” Really? That’s it?! I was at least expecting a lecture. Probably standard procedure when someone actually has a new reg sticker. Or maybe not. Maybe this guy had an extra bit of the holiday spirit in him today. And after that encounter, I did too. Who’d a thunk it? It is reasonable to say that, young as I am, I suffer greatly from C.R.S. (can’t remember, well you know). The more information I stuff into my brain, the greater the flow of facts, memories, and information back out. Not an uncommon ailment. When it comes time to send out the end-of-the-year Christmas letter, I rely completely on my pictures from the year. There they sit on my computer – in folders for each month of the year. I click through, take notes, and slap together a summary of sorts. Based almost solely on my digital record of the year and not on my personal recollection. Apologies to anyone and anything that had a significant role in my year but didn’t manage to get captured by my camera. I probably left you out. Journals and blogs serve a similar function but scrolling through pictures is more fun. Most of the details of my blog yesterday came courtesy of pictures. I had some images in my mind and specific recollections of moments during that day. The pictures provided the rest of the details. So I thought I would provide a few more pictures today since they served me so well. 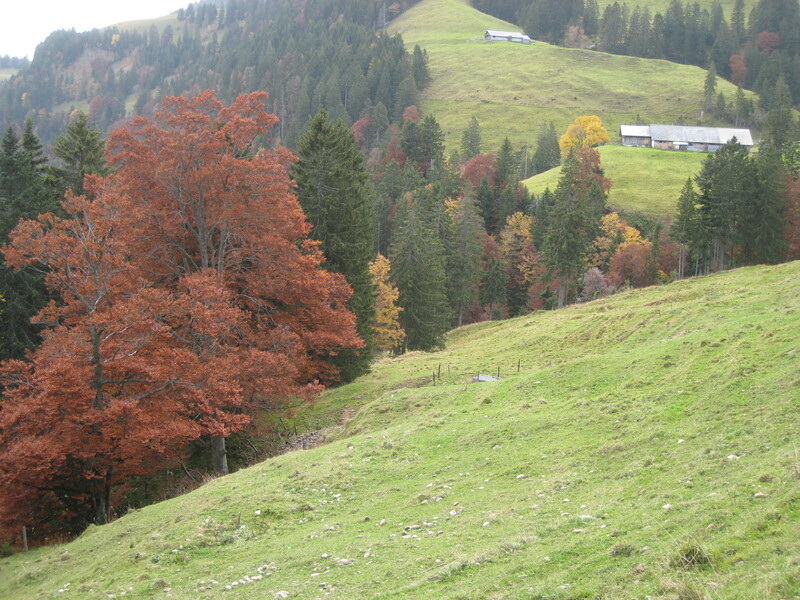 Enjoy, a hike on the Rigi Part 2, so to speak. Looking back at some of my photos, I am reminded of a couple of things. 1) I like food. 2) I never finished all the travelogues I was going to write about my Europe trip. 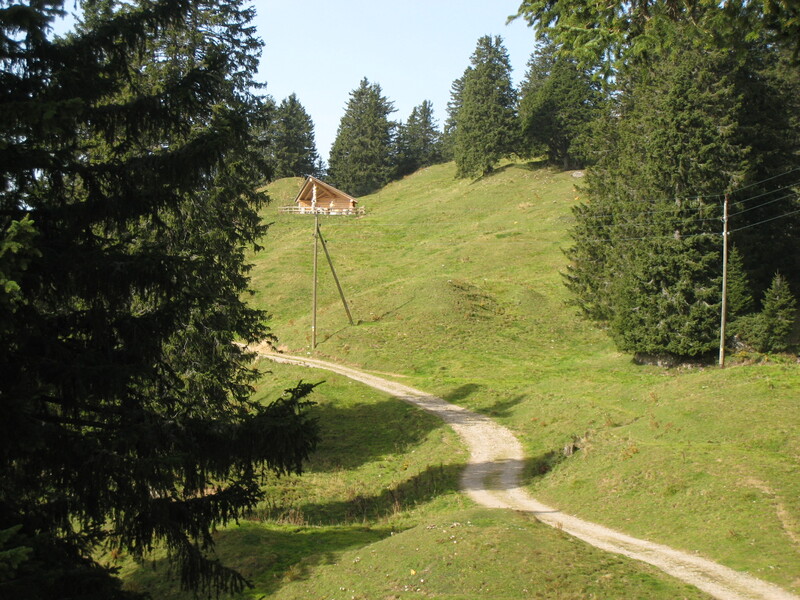 I managed to blog about the wonderful day Sweetie and I spent with my family hiking in Biel. It was a near-perfect day. But there was another day. Another day on a mountain. And it was grand…….. Morning came and Sweetie and I knew what our destination for this day was. Our Switzerland portion of our Europe trip had been left completely in the hands of my family. I told Sweetie that everyone wanted as least a day with us – Mom’s oldest sister, her middle sister, her cousin and his wife who live in Zurich. I rarely knew what was planned for the day. Sweetie, the improvisational wiz, loved it. But today was the Rigi. 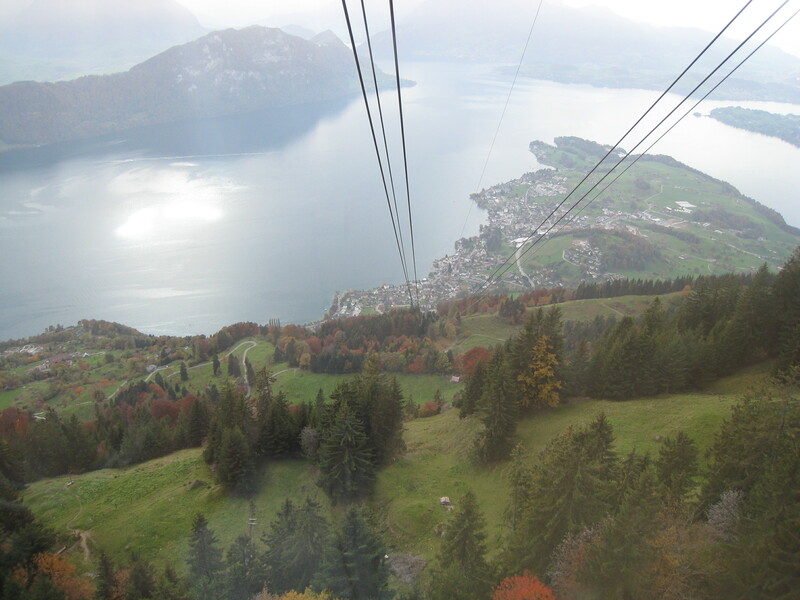 One can hardly stay in the vicinity of Luzern and not go up the Rigi. She is sometimes known as “The Queen of the Mountains.” What better way to pay our respects to the queen than to put on our hiking boots and tromp on top of her? After our customary breakfast of fresh bread and preserves, we gathered our backpacks and piled into my uncle’s car. My uncle drove. A good thing since my aunt never learned to drive. I have two aunts who never drive. Don’t need to in Switzerland. Between the buses and the trains which run constantly (and famously on schedule), many families have no need for more than one vehicle. I’m not even sure if three of my four cousins own cars. I think they do not. So off we drove halfway around the lake to the cable car station to wait for two more friends to join us. While waiting, my uncle presented Sweetie and me with our very own “Rigi” caps which we fit snugly onto our heads. Pia and Seppi arrived and up we went, through the tree canopy with its splashes of fall colors and away from the tiny houses beside the lake. 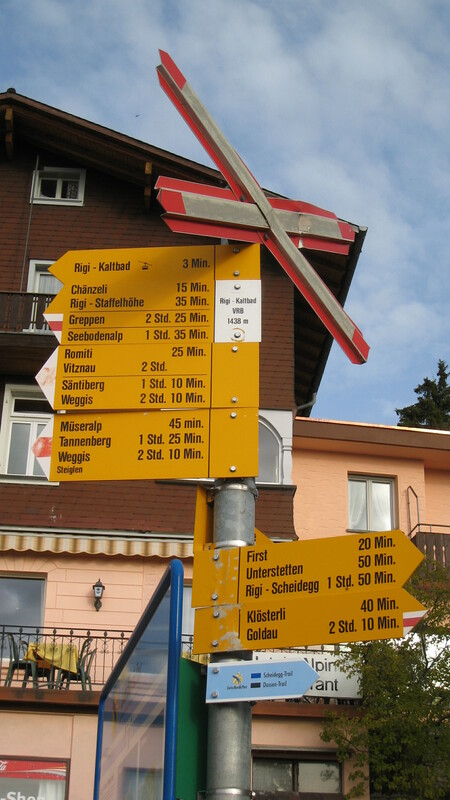 We disembarked and my family swept us past the trail markers: Chanzeli, 15 min. ; Greppen, 2 Std. (hour) 25 min. ; Weggis 2 Std. 10 min. We were on the trail with no idea where we going, how far we were hiking, or where this particular trail would take us. It was glorious. We started the hike on a wide paved trail in a forested area, with park benches and trash cans, and a log fence beside us. Sweetie and my uncle talked, as my uncle has the best English skills. My aunt, Pia and Seppi don’t speak much english. When I can, I translate their Swiss German (Schweizerdeutsch) for Sweetie, cobbling together what I remember from childhood talking to my grandparents and the little I remember from high school and college German classes. The family always seems surprised and amused when I laugh at something they say or try and translate for Sweetie. We walked and talked and took many pictures. 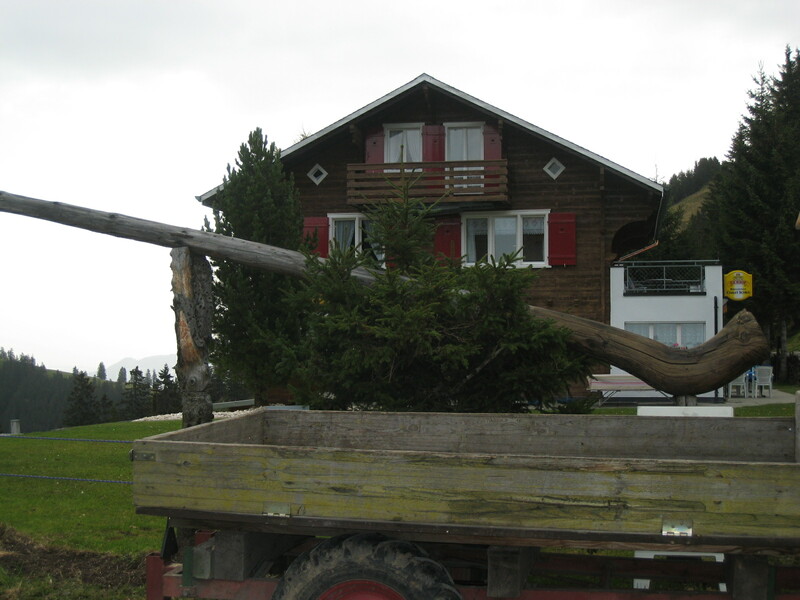 Sweetie snapped a shot of a gargantuan log carved in the shape of an alphorn. We transitioned to a more narrow dirt trail with barbed wire and wood fencing. There was a universal sign – the silhouette of a biker with a large red “X” through it. This portion was for the hikers alone. We walked beside the greenest of grass while crispy fall leaves disintegrated under our feet. We had views of the lake. The landscape took a dramatic turn and suddenly we had sheer rock walls to the left and a steep drop-off to our right on the other side of fence that was now metal posts and cable. 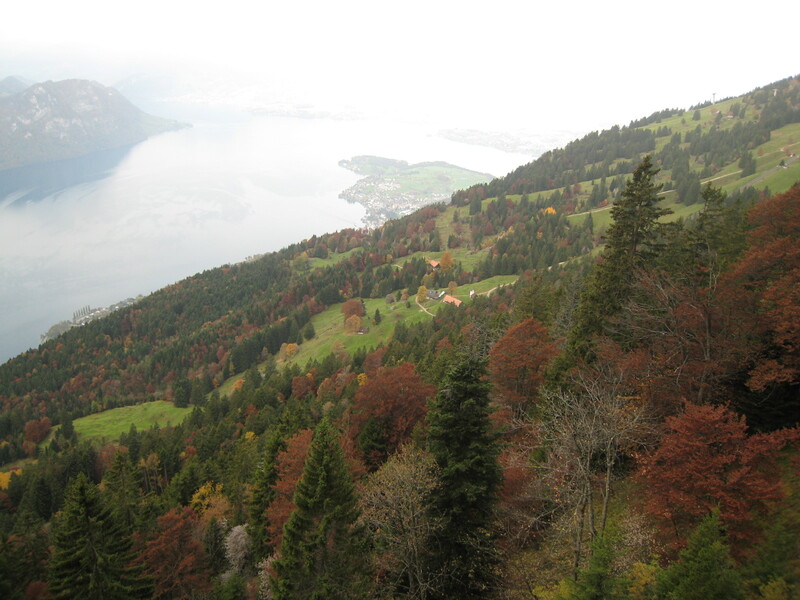 From this spot, we stopped at another park bench and looked down at the beauty and wild jabbing points of Lake Lucerne. Lake Lucerne was all I had ever called this lake. In college, my German teacher turned to me when got around to talking about Switzerland and asked me the name of this lake. I said: “Lake Lucerne.” No. She wanted its proper name. I had no idea. It is Vierwaldstättersee. Four. Forest. Lake. That’s about as far as my German gets me. Vierwaldstattersee is “Lake of the Four Forested Cantons.” The cantons are somewhat equivalent to states in the US. Wikipedia describes it as “The lake is a complicated shape, with bends and arms reaching from the city of Lucerne into the mountains.” That sounds about right. Looking at it from above, it reaches in all directions, dividing little bits and pieces of land around its meandering shores. We came out from behind the rocks and walked through grassy fields. And then, up ahead was a little train station. We sat down on more benches for a short wait for the stout little electric cable to chug us up to the top of the Rigi. 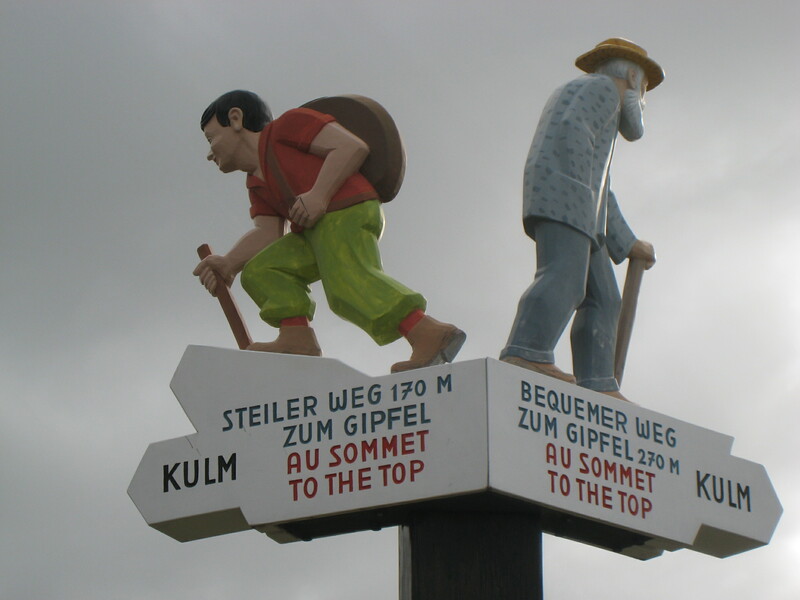 We trekked up to the summit: Rigi-Kulm, 1,800 m./6,000 ft.
And then, of course, it was time for a snack. I’ve blogged before about how much the Swiss like to eat and drink. And drink. I don’t think I’ve ever been out sightseeing, or hiking, or shopping, or anything with my family without stopping at least every two hours for something to drink (with the possible exception of mom’s middle sister who rivals my mom for lack of patience). Just wait until I get to the blog about our day in Zurich with mom’s cousin. It was taxing day for the bladder. Anyway, a snack on the Rigi. Not just any snack, mind you. No, there was no pulling granola bars and plastic-bottled water out of the backpack. We sat at a bench and my uncle and Seppi proceed to pull out small metal cups (their group hiking cups, we were told), a couple tupperware-type containers of breadsticks and nuts, and (of course) a bottle of wine. They laid six little cups out on the bench and six little cups were filled with wine. We toasted together and leisurely sipped wine while enjoying the views. The skies were a little overcast but we could see for miles in all directions. To our good health indeed! 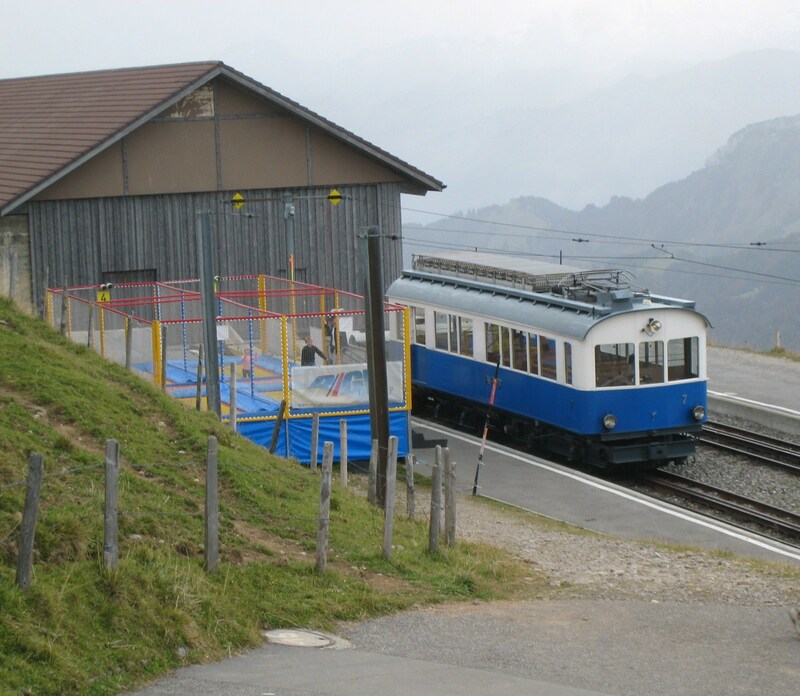 We made our way back down to the tram station and there we split up. 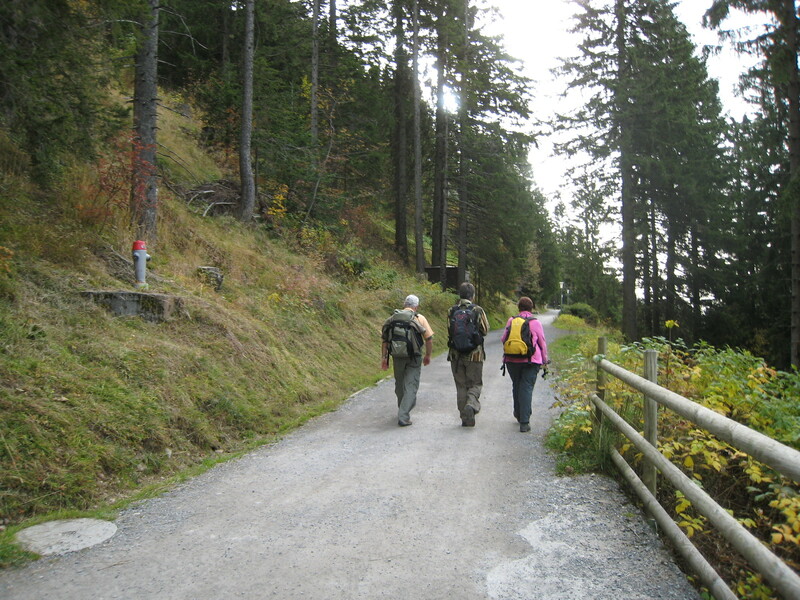 My aunt, uncle, Sweetie and I were to take a slow ambling hike to our next stop. Pia and Seppi were taking a “short cut” to get their quicker. Why? Well, to start setting up lunch for us all, of course! We parted ways, with my jolly happy rarely-drinking husband waving wildly as the wine worked its way through his veins. We walked downhill and the gray skies were replaced with bright blue, warm sun, and white clouds. We kept walking until we saw, on a slight hill above us, a covered picnic area. Supposedly, they are called Gruebinen. According to one site: For the construction of these shelters, the builders have used trunks, that have fallen at a recent major thunderstorm. The locals call such covered dwelling places which protect you from sun, heat and rain “Gruebinen”. 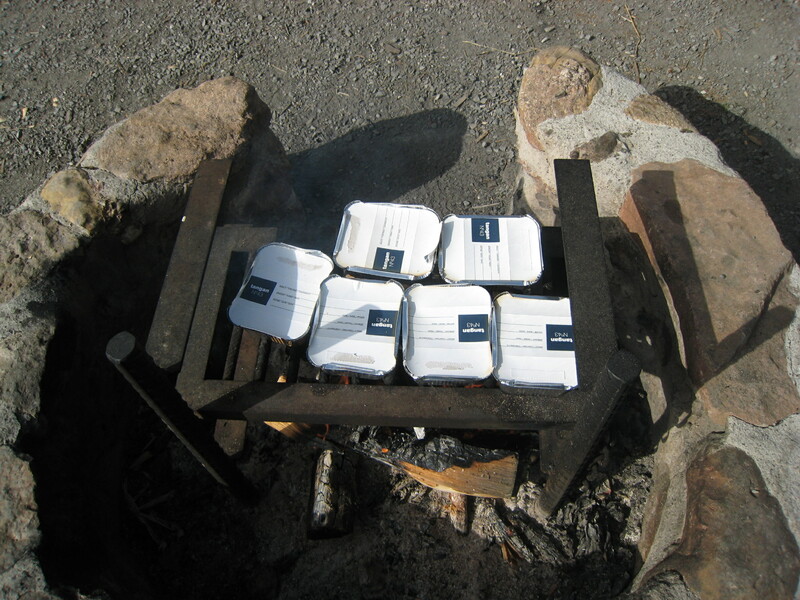 Of course, they are all well equipped with campfire-site, wood for burning, comfortable benches and tables. It’s all ready for you – enjoy your picnic or barbeque! By the time we arrived, our friends were hard at work preparing a feast for all. Indeed, the Gruebinen was well equipped. But not nearly as well equipped as Pia and Seppi! They had packed in fresh bratwurst, bags of carrot slices and small tomatoes, a loaf of bread, seasonings, and beauty of all beauty! – raclette cheese!! Oh joy! Oh happiness! 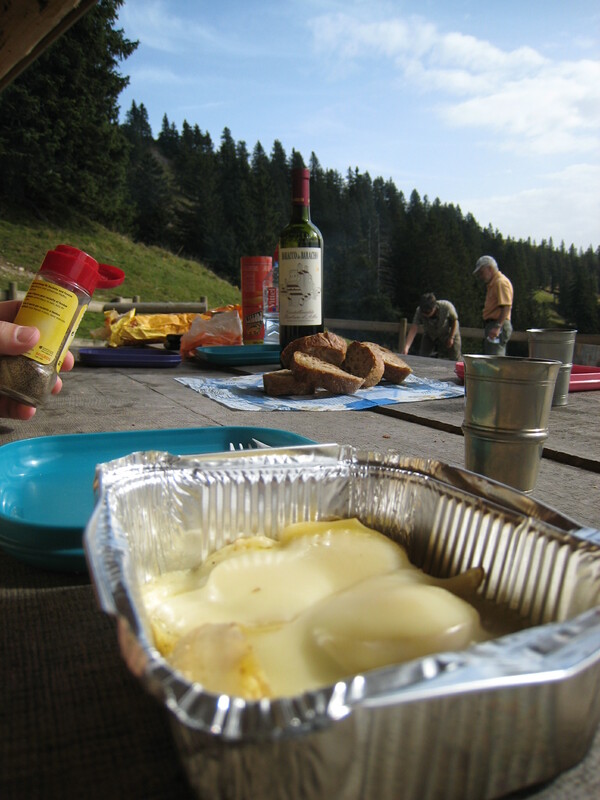 Of course, raclette cheese must be served warm and melty over potatoes. These dishes came pre-packaged in tin foil containers with potatoes included. 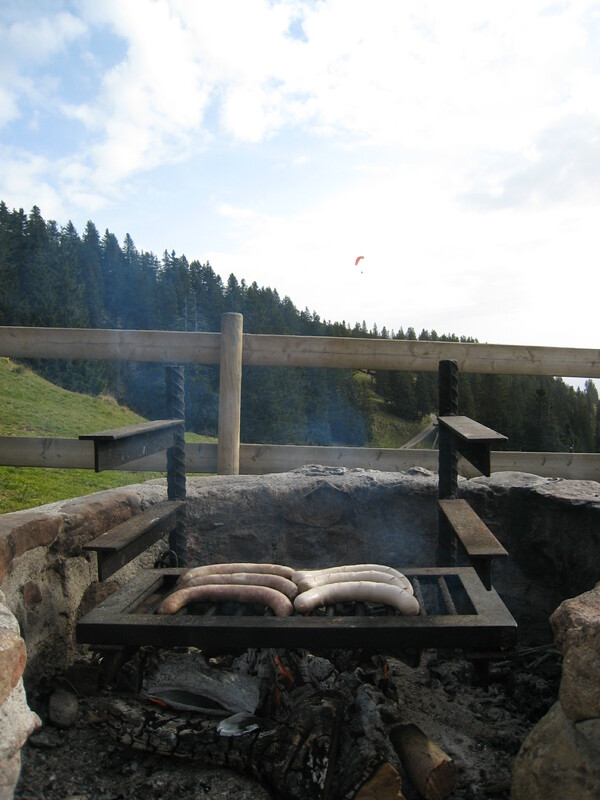 Seppi had six little packs of cheese warming over the open fire along with the bratwurst. Six little bundles of cheesy goodness to pry open and devour with a fresh bottle of wine and all the other food already spread around the picnic table. Can you possibly imagine being more spoiled than that? I cannot. It was heaven. 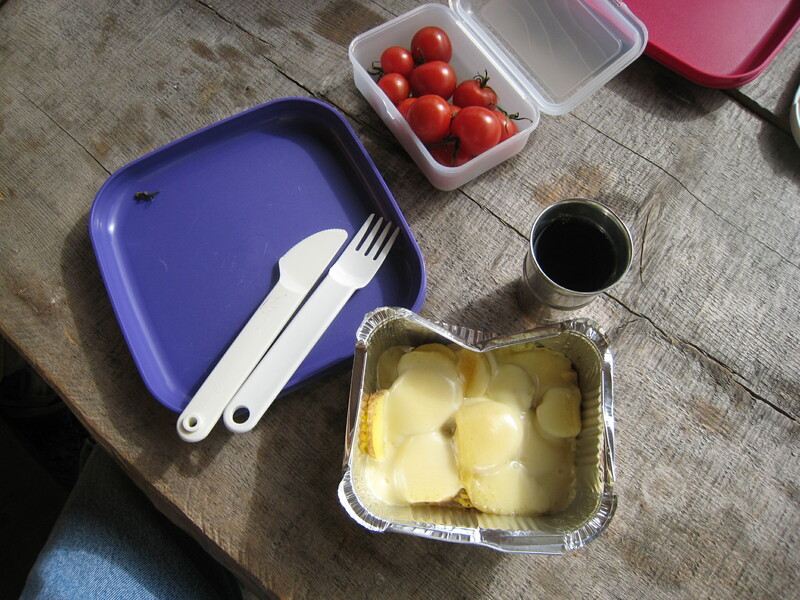 We sat and vegged by the picnic table as our systems started to digest the food. My uncle pulled out one of his ubiquitous skinny cigars, put his feet up on a stump and puffed away. My relaxed hubby sat in the shade with his back against the fat pale logs and just stared out at the green hills. Or maybe he slept behind his sunglasses, I’m not sure. More hikers came along and added more wood to the fire for their own lunch. We abdicated the picnic table and made our way down to a final lookout spot before catching the cable car back down the mountain. 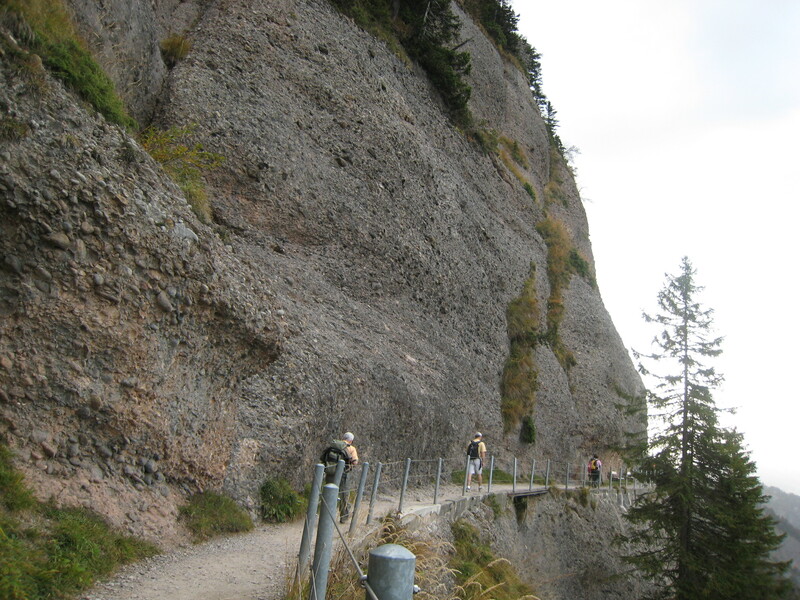 We slowly made our way back down the Rigi. Sweetie and I marveled at the beautiful fall colors and at (once again) our amazing luck in vacationing in October in perfect weather. The possibility of rain exists year-round in Switzerland, but they had just come through some cold and stormy weather. Yet we had sun every day. 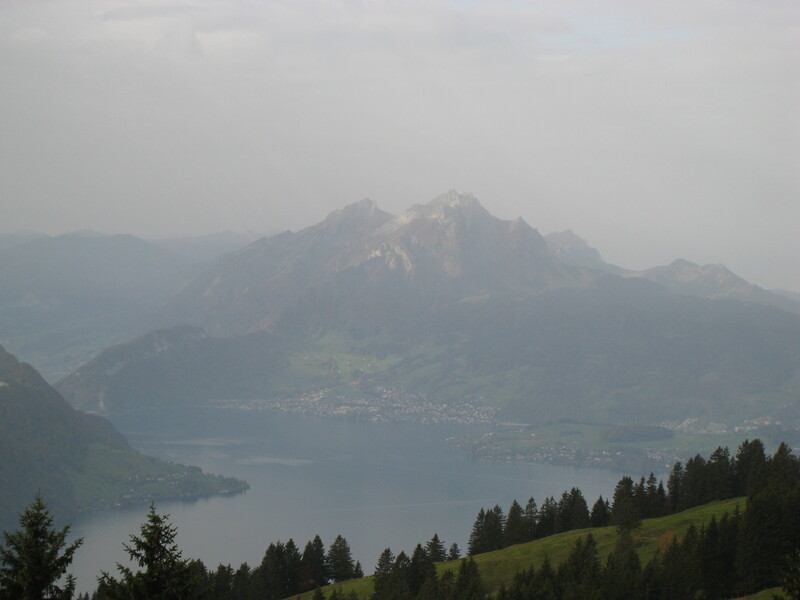 Most of our time with the family was spent outdoors and there would have been no way we could have hiked all day along the Rigi in rain. As Sweetie and I just celebrated a third October hiking outside in surprisingly gorgeous weather (the first was in Yellowstone, this third was in Yosemite), I told him I think both our fathers are looking out for us around our anniversary. Someday, maybe someday soon, our streak may end and we’ll spend a stormy cold October together. 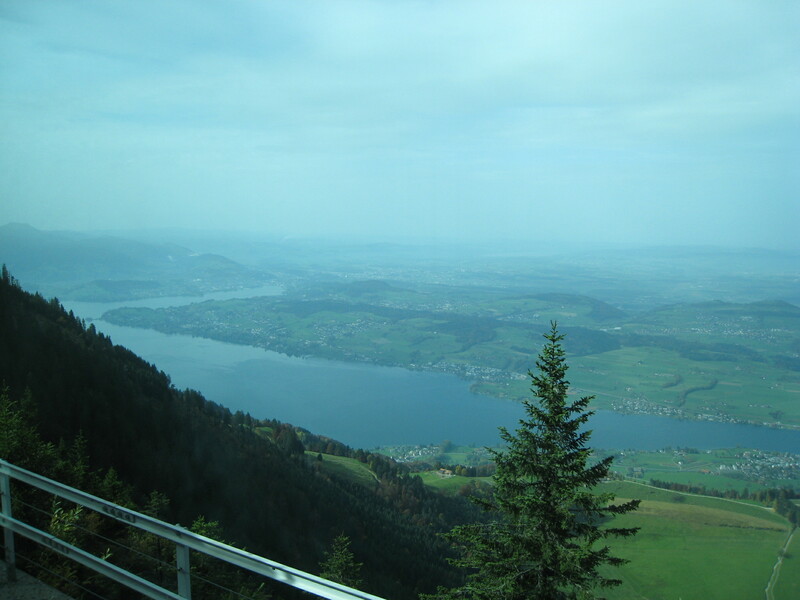 But for us, that day on the Rigi with family and friends is probably one of our top five days together ever. It was certainly the best day of a fantastic trip. And that, is the story behind that one little photo. I smile just looking at it. Remember the days when flight attendants helped you while you were boarding the plane? These days, the two in front tell you what aisle to walk down and that’s it. The rest stand in the middle and back of the plane gossiping with each other, reading the newspaper, or talking on their cell phone. If a passenger is having a hard time getting something into the overhead compartment, tough. If a passenger is dawdling in the aisle backing up the whole line like a clogged drain, tough. So what if the rest of us have to stand still for 10 minutes while Mr. Indecisive puts a bag up, then grabs something from it, then brings it down, then puts it up again. I’ve seen a flight attendant holler at the line – What’s taking so long!?! – but does she move to help? No. Is there something new in airline liability insurance that forbids flight attendants from helping with bags? I don’t understand why anyone would pay more for a business class seat for a 30-minute flight. If it’s part of whole series of flights, then yes. But who needs a few inches of extra leg space for 30 minutes? Don’t you love it when you’re sitting at the gate and you hear the screaming kid start up already? I’m not talking about babies who are going to cry. I feel sorry for any parent with loud kids during long flights and I’m pretty tolerant of them. I’ve even gone out of my way to reassure a mother who was scolded by another passenger for her loud kids. Which was crap – the kids weren’t screaming or whining or crying. I, and another passenger, told her the kids were fine during the flight. Mostly, I’m talking about kids who throw tantrums without the parent saying boo to them. Regardless of your opinion though – you know when you’re sitting in the terminal , whether you feel bad for, or mad at, the parents, you are thinking: “PLEASE let these kids be far far away from me on the flight.” Lots of times, these kids board first. Then it’s your turn to board. You walk on the plane looking for your seat with one eye out for the bratty kids. You pass them on the way to your seat and think: “Whew! Dodged that bullet.” Last time I flew I sat at the gate across from a woman and her son – he must have been about 11 or 12. He was talking back to her and running around and she kept telling him “You are NOT getting your game.” So, he dug into her purse on his own and pulled out a little Gameboy and proceeded to play it. Oh yeah. Great kid. Guess where they ended up? Right behind me on the flight. She had no idea how to discipline this kid. She kept whining at him to be quiet during the flight. Then she threatened him with: “You’re going to get in trouble and the police are going to get you when we get off the plane and take you away” and things of that nature. Really? That’s how you get your kid to behave? Speaking of kids, don’t you love it when they play around the luggage carousel while the automated terminal voice is warning everyone not to let their kids play on the luggage carousel? Don’t you have a secret wish that a big piece of luggage will snag onto that kid’s pants and whisk him/her away and down the carousel? Not to cause great injury, of course. But maybe a little undignified drag by the rump will teach other parents not to let their kids play on the carousel and take up valuable carousel real estate when whole crowds of weary travelers are trying to make their way up to heft bags home. Speaking of that valuable real estate, standing there trying to hold my tiny sliver of space next to an airport luggage carousel hearkens me back to the great “general admission” concert days of old. No, I will not move. Yes lady, you can walk right up to me and expect me to step back away from you but I won’t. In fact, I’ll inch closer to your face until *you* step away from *me* when I am standing here first. Yes, thank you, go hide behind your boyfriend. No, I don’t feel particularly cranky right now. I’m in a good mood and had a relatively uneventful flight. Why do you ask?